Having the car wash come to you may be more affordable than you ever would have guessed. At the time of this publication (in April 2019) there are several companies in the Los Angeles area which offer package deals starting just under $30. The lowest price we found was $22.99 for the “Express” package at MobileWash. 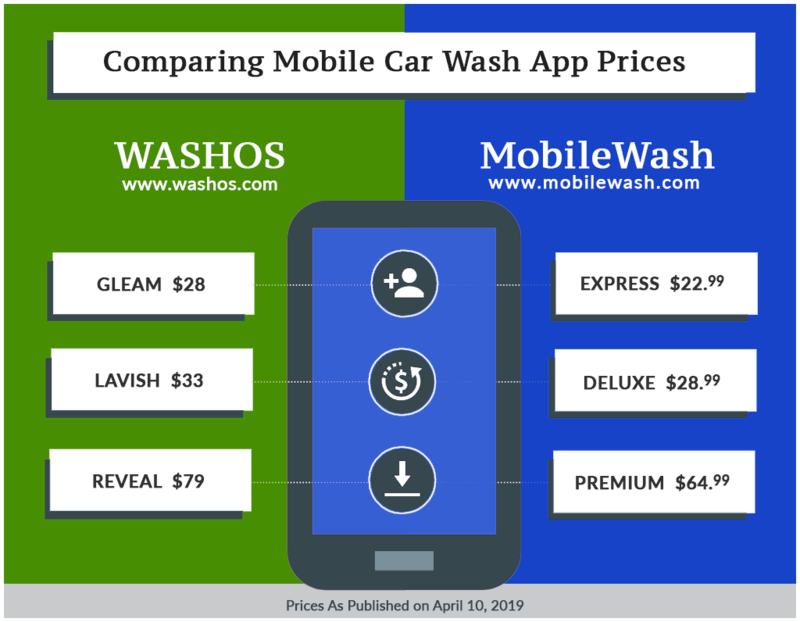 Other companies like Washos and Washe have similar entry-level packages with mobile car wash prices ranging from $25 to $28. Washe offers a “Silver” car wash package starting at $25. Washos offers a “Gleam” package starting at $28. These mobile car wash prices are similar because these packages have some elements in common, but there are also some big differences. Perhaps the most noticeable difference is the water, or rather, the absence of it. Most car wash companies use water but Washos does not. They skip the water and wipe your car down with chemical sprays instead. Washe sometimes does this too, with some of their detailers doing only waterless washes. What these basic car wash packages tend to have in common are the essential things that make a car wash what it is. A gentle hand cleaning of the vehicle’s exterior, cleaning the tires and making the wheels shine, and cleaning the windows. Exact details vary with each car wash package. If your car needs a little more attention, or if you want to also clean the interior, you can get one of the mid-priced mobile car wash packages. Beyond the exact mobile car wash prices, you might be wondering about related issues like, which methods of payment do they accept? Are there any hidden fees? What kinds of discounts are available? Is this service available in my area? All of these mobile car wash companies accept payment via credit card and seem to prefer that method of payment. MobileWash customers pay through the app. Washe says they are 100% cashless. Washos processes all payments online through their website or smartphone app. And Get Spiffy does not accept cash payments either. If you are concerned about being hit with hidden fees be sure to ask about the size and type of your vehicle. They may charge a few dollars more if your vehicle is larger than average or requires more time and effort to clean. Washos adds between $7 and $12 accordingly. Similarly, Get Spiffy differentiates between sedans and non-sedans, such as minivans, pickup trucks, crossovers, station wagons, and SUVs. MobileWash uses advanced technology to calculate a custom price quote, based on multiple factors including the exact make and model of your vehicle. The price you see is the price you get. Each of these companies occasionally offers discounts, promotions, and coupon codes. Signing up for their email lists and/or installing their apps are a great way to make sure you don’t miss out on deals. Following them on social media is helpful too. Sometimes they’ll do a promotion specifically for Instagram or they’ll run a particular advertisement only on YouTube. If you want to see it all be sure to connect with them on multiple social media networks. YouTube, Facebook, Twitter, Instagram, and even Pinterest. Assuming there are multiple companies which serve your area and you find the mobile car wash prices to be agreeable, you can now move to the next step in your decision process. When considering which company to use and which package to choose, you may benefit from being mindful of the following things. First, is your budget. If affordable pricing is a primary concern then the clear choice seems to be MobileWash. Second, is your time limit for having the wash completed. Some companies prefer to schedule you for later in the week and don’t provide on-demand service. If you are in a hurry then you probably need to choose a company which offers on-demand washes. Third, is methodology. Which cleaning methods do you prefer? For example, would you prefer a waterless car wash or do you enjoy having your vehicle soak in foam and soap suds? Everyone’s needs are a little bit different, so before you order your next mobile car wash have a closer look for yourself. If you still have questions, be encouraged to reach out to the customer service department at each company. Phone numbers are provided below.